House Flies are 3/16”-5/16” in length and black with 4 dark stripes on thorax. The abdomen is greyish or yellowish at the sides and has a dark stripe down the middle. These flies have fleshy sponging mouthparts and do not bite. The eyes are reddish and are well separated in males. The eyes have a golden stripe around the outer edge. The legs are hairy with adhesive pads and sharp claws. The wings are clear and are held level and straight back. The House Fly is probably the most common fly found around horses. Most flies caught in houses are House Flies. The House Fly causes problems in stables, poultry farms, dairies, sanitary landfills, or other sources of rotting organic matter of plant or animal origin that attract egg-laying females. House Flies have been implicated in the spread of over 30 bacterial and protozoan diseases. Fortunately, House Flies do not transmit many of these diseases with great frequency. But because they could transmit serious diseases, House Flies are considered to be a greater threat to human health than most other insects. The female lays each batch of approximately 150 eggs on wet, decaying organic matter lying in the open (i.e., on wet garbage, animal manure, spilled feed, bedding, decaying fruit, compost piles, rotting plant debris, landfills). She can lay 4-6 batches in a lifetime. These eggs usually hatch within 24 hours into tiny, creamy-white maggots that feed in the waste. Mature maggots migrate away from their food sources in search of suitable sites for pupation (forming their cocoon). They change into the pupal stage from which the adult flies emerge. It takes about 2 weeks for a fly to go from the egg to adult stage, but at the optimum summertime temperature this can be as few as 8 days. Males live for 2 weeks and females up to 3.5 weeks. Adult flies feed on a wide range of materials, including manure, garbage, fresh and decaying fruit, and most human food. 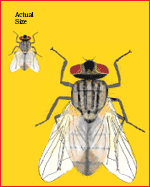 Adult flies are very strong fliers and can travel ¼ mile and some times much farther. However, usually they develop at the same facility where you see the adults. This species normally is one of the main problems in animal operations. Fortunately they are very effectively controlled by Fly Predators.